Education’s annual Patron and Trustee event. He will speak at 6:30 p.m. Tuesday at the Lorraine & Jack N. Friedman Commission for Jewish Education’s annual Patron and Trustee event at the Palm Beach Country Club, 760 N. Ocean Blvd . Jacobovici’s discoveries form the basis for creating Quest for the Lost Tribes. The documentary follows Jacobovici from his meetings with the Taliban, to an ancient Jewish presence on the island of Djerba, to China, India and throughout the Middle East. For the past 10 years, Jacobovici has applied his journalistic skills to historical and archaeological investigations. 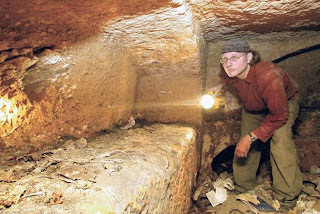 He calls this technique “investigative archaeology.” As a result, Jacobovici has also produced the documentaries The Exodus Decoded and The Lost Tomb of Jesus. He also hosted three seasons of the series The Naked Archaeologist. He is an adjunct professor in the Department of Religion at Huntington University, an affiliate of Laurentian University in Sudbury, Ontario. A modern Orthodox Jew, Jacobovici, together with his wife, Nicole, and their five children, moved to Israel in 2009. The event is held in honor of the patrons and trustees of CJE who each donate a minimum of $5,000 annually to support educational programs for community members.